The X Buster was not canceled. I had one before I donated it to my little brothers. I'm itching to find that X Buster myself, but I haven't seen it on Ebay in a while. How could they have cancelled Sigma? 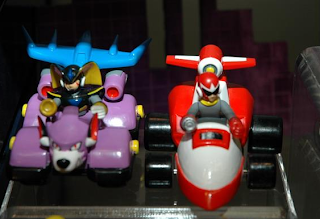 I remember the New York show in 2006 me and Daniel "Protoman" Arseneault went to that one and flipped out when we saw the PVC figures. It's a shame the Battle n Chase stuff never happened. If I remember correctly, the battle damaged figure and multi-colored Mega Men weren't ever planned for actual production, but were just something they did for fun.